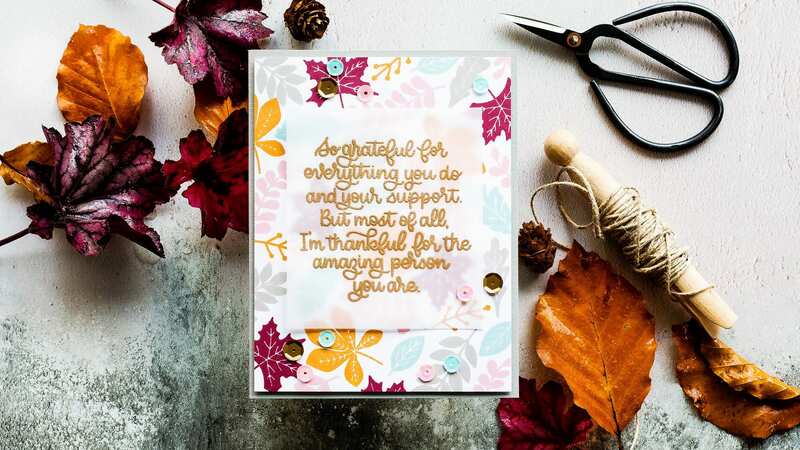 I have a video today sharing a quick, simple and colourful fall card using the Thanks & Leaves set from the recent Simon Says Stamp November Card Kit. 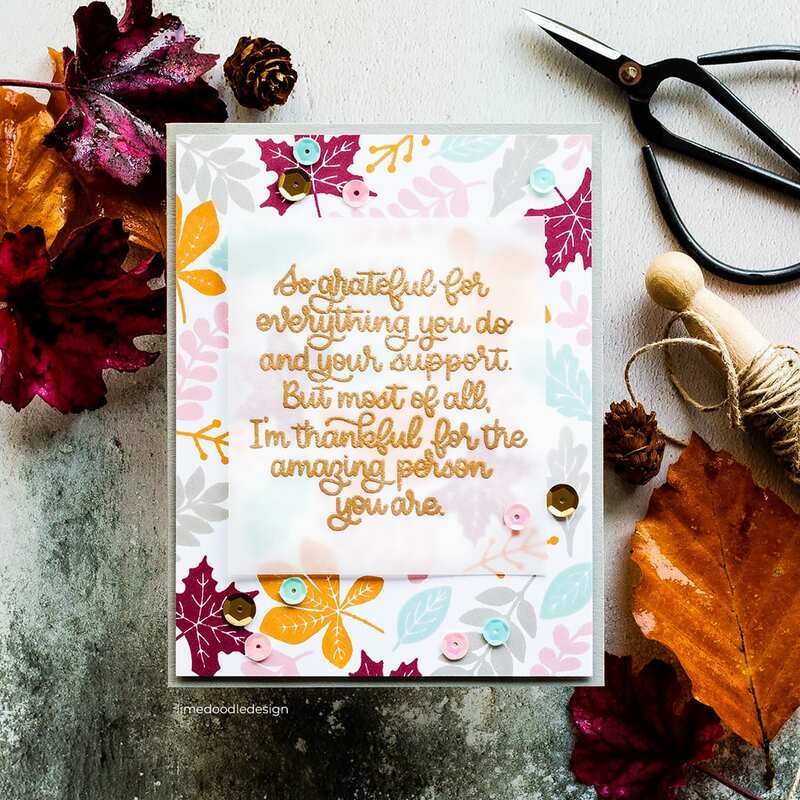 As I write this post, there are still a few kits left, but equally the Thanks & Leaves stamp set can be purchased separately. I’ve linked all supplies at the end of this post. Compensated affiliate links used. I chose a lovely grey as the neutral to pair with the other colours. I’ve always had a fascination with grey and use it as my neutral of choice rather than some of the warmer creams and browns which may have been a more obvious choice for this card. I placed a piece of Neenah Solar White card in the Misti and starting in the top left corner of the card, I stamped the first leaf. Depending on the coverage after stamping once, sometimes I chose to repeat and stamp a second time to get a good solid impression. With dye inks, you do have to be careful though with the fine details of the veins in some of the leaf images. 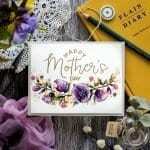 One of the properties of dye inks which gives such lovely results is that it soaks into the card, smooths and softens as it dries. However, this also means that fine details can be lost. I stamped the first orange leaf twice but after that any leaves which had fine details I tried only to stamp them once, so I didn’t lose the details. So grateful for everything you do and your support but most of all I’m thankful for the amazing person you are. How lovely is that! You could stamp this sentiment directly on top of the leaves, but I was worried it would get a bit lost amongst the busy background. I decided on stamping the sentiment on vellum instead. This way when layered over the background panel you will still be able to see the leaves peeking through the vellum and giving them an almost misty look which I felt suited the autumnal theme. I treated the vellum with a powder bag and then stamped the sentiment in clear embossing ink before sprinkling with antique gold embossing powder and heat setting. I then added the leaf background panel to a Smoke card base. This colour picked out the grey in the stamped leaves perfectly. I then added tiny pieces of foam adhesive to the back of the vellum. I chose areas where the lines of the text were slightly thicker so that the adhesive wouldn’t be visible from the front. Finally, I embellished the card with bronze (from the card kit), and Christmas Magic sequins from Simon Says Stamp along with some pink sequins from Little Things From Lucy’s Cards and kept them in place with Nuvo Deluxe Adhesive. Your colors are wonderful! Thank you for the lovely video. This is a lovely card. Most of our leaves are gone now but these colours are what autumn looks like in my yard! The pink and blue are the colours of the morning sky as I write this from Alberta, Canada! 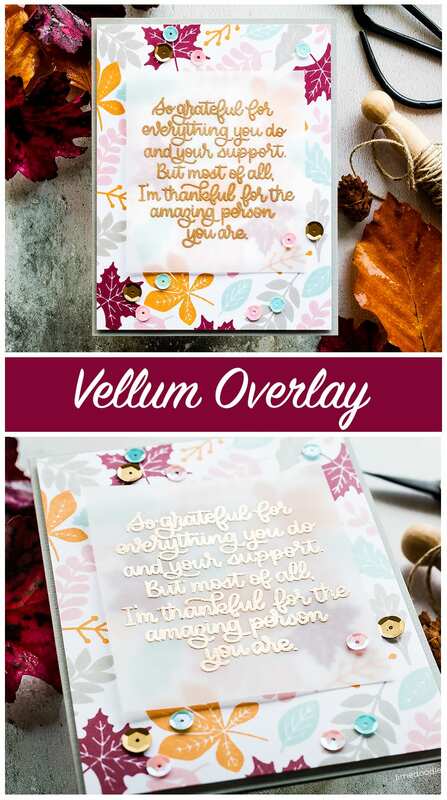 What gorgeous colours for your leaves and the vellum looks so elegant on top. Beautifully done. Wonderful card Debby and such great colours, I love Autumn colours. Thank you for the how-to-video! Great card. Love the fall colours. Debby that’s beautiful, such a nice colour pallet, modern but still autumnal. Fingers crossed will be able to finally do your colour theory class that we signed up for. Great tip with the adhesive on vellum thanks .